← ProfileUnity 5.7, Hold on for the Speed!! You’ll note there are seven official layers to the model. From bottom to top, they are grouped into similar communication functions, which map to each of the seven logical layers. Not surprisingly, these layers also map to the technological challenges that must be overcome to deem a project successful. 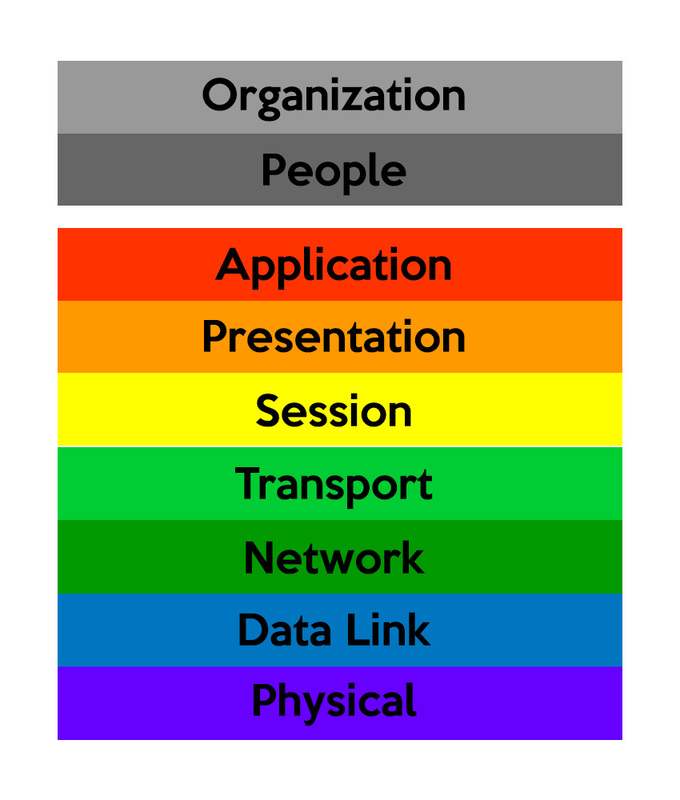 The people layer represents those individuals who may not embrace or roll with change—note this may be end users, or a curmudgeonly IT team member who does not adopt the skills required to support a desktop paradigm shift. The organization layer represents the politics or other top-down pressures that create project speed bumps; these can be financial or bureaucratic-driven challenges. VDI Does Work, It May Be You! I’m sure you know what I mean by people and organizational issues getting in the way of success. And to be perfectly clear, these problems may exist between the keyboard and your chair (PEBKAC). That’s right, VDI has received a bit of a bad reputation because of folks not doing it correctly. Formally as a solution provider and now as a team member working with a company focused on making the desktop transformation easier, I say this with authority … quite a few IT pros fail at their own hand. As I noted in my previous posts, make sure you invest in the critically important steps of an assessment and proof-of-concept. This is necessary to get your house in shape and ensure you have a solid foundation and knowledge base—before racing to pilot the project and bring users into the mix. Too often I see projects stall in early phases due in part to preparedness; they stall or fail both technically, due to a lack of visibility into architectural performance, and due to other layer-eight and nine issues. I don’t want to get into a technology-related discussion about persistent versus non-persistent virtual desktop approaches. There are merits to both, however I do prefer the latter. That said, I often see IT organizations that implemented persistent pools; either because they didn’t know any better at the time, or there were challenges in the layers above seven that caused them to do so. I mentioned in my last post that the proof-of-concept is to determine feasibility. Specifically, I noted that a key output of the process is to assess the skills and demands that will be placed on your team. To reap the full benefit of a desktop transformation requires that you both consolidate the workload and change the desktop lifecycle approach, as well as the associated management workflows. Think of it this way… If you simply consolidate your desktop workloads—moving them from the edge to the data center—you really have not changed the way these workloads need to be managed. This ties back to the statement made earlier; persistent environments were cast to allow organizations to maintain their existing management workflows (layer-nine issue) or because of PEBKAC (layer-eight issue). Take the time to examine the opportunity to optimize/change your desktop management strategy—in fact, the vast majority of benefit here is with regard to operational efficiencies, minimizing disruption of end-users and minimizing risk to the architecture. Over the long run, weeding out your layer-eight issues will pay you back in operational expense savings that far out-weigh any capital expense spend. As your team and the IT management workflows become one with the new desktop delivery strategy, you should turn your attention to the layer-nine issues that can stall you in your tracks. I won’t be able to note them all, but will focus on a couple of themes that tend to bubble to the surface. The first and obvious layer-nine theme are those related to capital expense. Many senior business leaders have been trained over the years that IT savings can continue forever, based on squeezing efficiencies out of existing investments. We’ve been able to reduce IT cost and complexity in this way before, why is this desktop transformation thingy any different, they say. Related to realizing IT efficiencies through the “better-faster-cheaper” approach casts the virtual desktop transformation as yet another project that can easily be accomplished with a one-size-fits-all, off-the-shelf solution. Be cautious in allowing the desktop transformation to become commoditized. Again, we are not simply talking about a new technology widget; we are talking about departmental and management workflow changes that will transform the desktop as well as the IT function. I won’t pretend to have the simply answer that will change these perceptions. What I will say is IT needs to increase its business acumen and begin to quantify and increase the communication around return on investment and total cost of ownership. Start with a Liquidware Lab’s Stratusphere™ FIT-based assessment of your existing desktop resources; and be sure to pay attention to things like number of applications installed versus used. Can you name how many users talked IT into requiring an 8GB, SSD-based laptop; and are not even close to consuming those resources? A focus on the inefficiencies, over-provisioned desktop hardware and application sprawl combined with the operational savings, minimized risk and ability to keep the organizations’ users productive, should capture attention. And for those of you fortunate to work in an organization where compliance, security or mobility reign supreme, be sure to talk about the immeasurable benefits of centralized management and resource use reporting. The second layer-nine theme I’ll mention is centered on the management of existing infrastructure and who owns the desktop user experience. Let’s face it, IT has silos. There are the desktop guys, the server and storage gals, those networking gurus, and the business application ladies… Everyone has their fiefdom. Add a virtual desktop layer perched atop this siloed management approach, and well… it will be a mess. This organizational layer-nine issue is ultimately about accountability and who owns the user experience. With the right visibility into the contributing layers of the infrastructure (ISO layers one through four), you can avoid the internal finger pointing game, implement a tiered management strategy and quickly get to the heart of whose infrastructure is mucking up the overall architecture. This is easily accomplished with a solution like Stratusphere™ UX, which offers the ability to provide end-to-end visibility into the contributing infrastructure layers. Finding architectural issues, and routing them to the appropriate IT silo is challenging when you’re experiencing downtime. But what about proactive management? How can you stay ahead of controllable issues and ensure that you avoid virtual workload disruptions in a more ongoing manner? Most forward-looking data center approaches would have you turn your focus to the user experience. With a known threshold for virtual machine, user and application-centric values, Stratusphere™ UX can monitor and alert you to issues brewing under the surface long before they become systemic. Implementing a purpose-built desktop transformation architecture is not easy. And with all the technological challenges working against you, don’t let the people and organizational challenges stand in your way of success. Stack the deck in your favor with an assessment and proof-of-concept, as well as ongoing and proactive visibility into your desktop transformation architecture. These are the critical components to measuring, planning and monitoring for success. More importantly, these are the elements that will form the foundation to combat layer-eight and nine challenges. I’m sure I’m missing many, many layer-eight and nine examples… I want to hear about yours as it relates to the desktop transformation journey. Please take a moment to post yours in the comments section below. * Some have referred to layer eight and nine as “financial” and “political” layers respectively (Layer 8). For the purposes of this post, they are wrong. Joking aside, whether you call these financial, political, people or organization, it really does not matter. If these layers derail your efforts, you’ve been beaten by non-technical challenges; and your project still fails. I agree with you wholeheartedly – we understand layers 1-7 just fine, but you must think about layer’s 8 and 9 beforehand if you want to be successful! Shawn — Thanks for your comment. Time-and-time again we see projects get kicked in the face for things outside the realm of Layers 1-7. Recently I spoke with a VDI champion who had a significant project come under fire due to a few Executive VPs; who were upset their laptops were taken away. With Liquidware Labs’ Stratusphere UX, the project lead was able to squash the purported “slow VDI workstations” and quantitatively show they were FASTER than the laptops they replaced! If you’re not employing proactive monitoring of user experience metrics, we’d love an opportunity to show how you might combat resistance on the part of your people.